3rd broken string this night at the Schuss Bar. I want this post to focus on giving you all an up-date future for the H-Cee Family and why we have decided to cut back on our wedding commitments in 2019 as announced here on our Facebook page. At the beginning of 2017, just as we were re-shaping the band with the addition of Jay on guitar and Junior on bass, we sat down one night and had a bit of a brainstorm around what we wanted from H-Cee Family (still Hard Cover at that time). What we said was that we wanted to write more originals, create our own music and try to get into playing some other gigs that we though would be cool. Playing at festivals like Groovin the Moo, Splendour in the Grass and the Byron Bay Blues Fest were some of the gigs that we wanted to play. We wanted to record our music in studio, see if we could get some traction, a little bit of air-play and really just see how far we could go on our own sound. So we started writing songs and trying to find ‘our sound’ but the regular cover gigs and 2017-2018 wedding season kept rolling on, leaving little time to explore the direction we hoped to go in. Being who we are, we also wanted to try and make sure we were not going stale with our cover sets and continue learning new songs and keeping it fresh not just for our audiences but also for ourselves. Then at the start of this year, we got the Thredbo residency at the Schuss Bar. Originally the plan was to continue practicing and jamming every Saturday before the big band gig each week but as often happens, life kinda had different ideas and pretty soon, we had stopped writing and stopped focusing on our music. Another fantastic gig at one of usual venues - PJ O’Reilly’s in the city. We felt we were at a cross-road - would we be a good covers band who played a few originals or would we make more of an effort to work towards the things we had put on paper at that brainstorming session 18 months ago? Well, we decided that we aren’t the kind of people and we aren’t the kind of band who will die wondering - we’re gonna take a swing and see what happens. And so we have decided to take a step back from booking so many weddings and gigs and try to spend more time and energy creating our own music and working towards ticking a few things off our ‘bucket list’. It also means we can spend more time with our loved ones as well - the true heroes and inspiration of each of our stories. We will still be doing at least one wedding a month and at least one public gig out and around Canberra so we aren’t going anywhere….you just might not see as much of us as you may have in the last 4-5 years. Love and peace Family….look forward to seeing you out and about soon. In the last couple of years, the H-Cee Family have been up to Thredbo a few times playing 3-4 times each snow season. Since we were up there fairly regularly, we took up snow boarding and began hitting the beginner slopes pretty much teaching ourselves or learning from experienced friends who would come to hang-out with us. This year the Family is looking forward to hitting the pow a bit more and maybe even getting good enough to board a few black runs. Opening weekend starts this Saturday and the early forecasts are that this could be on e of the best snow seasons Australia has seen in a long time. There are even some early predictions that 2018 could be the coldest winter on Australian record. What an amazing time to be in Thredbo every week! But while the temptation to spend every waking minute playing in the snow might be hard to resist, the H-Cee Family have big plans and we'll be putting some serious man-power and time into refining our music, writing new songs and getting tighter as a playing unit. There is plenty to keep an eye on over the coming months so stay tuned in Family....this winter will be one for the history books. As many of you will know, the H-Cee Family have been going through some exciting changes and transitions over the last 18 months or so. One of the 2 founding members of the band decided it was time focus on other things. We recruited 2 new musicians into the band. The talented Mr. Dean moved to a live drum kit full-time. The band started writing and playing original music. We changed the band name. It's been a busy time with a lot of awesome gigs and road trips and laughs along the way. In a few weeks we will start our first ever band residency at one of our favourite venues - the Schuss Bar in Thredbo. We started playing in Thredbo about 2 years ago after meeting the GM who saw (and heard) us play at a wedding in Jindabyne. It was a fantastic wedding with an awesome group of people, a really cool bride and groom and beautiful DIY venue - a marquee set-up over-looking the lake with a dance floor (and the band) outside under the stars on a gorgeous summer night. I remember passing our business card to the GM, who was a guest at the wedding, and thinking that given the state most of us were in, it probably wouldn't come to anything. Well...this will be our 3rd winter playing in Thredbo as well as playing the NYE Party and New Years Day Pool Party this year at the hotel. 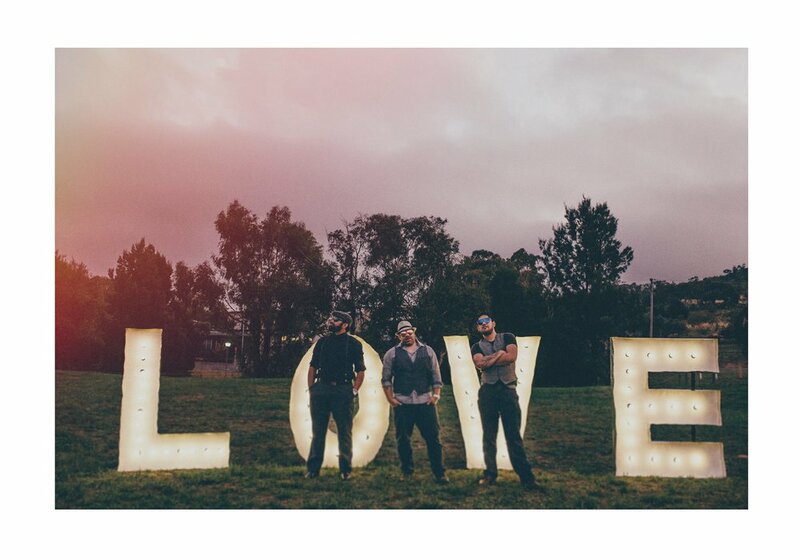 This photo was taken at that Lake Jindabyne wedding by the amazing Lisa Lois Photography.